Marino is an improvement to the standard Coriander. Clearly more resistant to flowering early. Attractive dense foliage and thin stems. A very healthy plant. 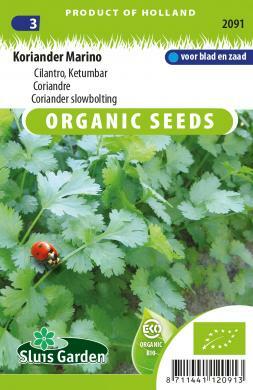 Also known as Cilantro, Coriandolo, Dhania, Ketumbar, because Coriander has two fl avours. The leaf (Cilantro) has a unique, fresh parsley fragrance and is an essential herb in Mexican and Asian salads, soups and meat dishes, whilst the seed (Coriander) is a spice with a pleasant fragrance and is often used in European and Middle Eastern cooking.